‘Resolutions upon the subject of domestic slavery having passed both branches of the General Assembly at its present session, the undersigned hereby protest against the passage of the same. They believe that the Congress of the United States has the power, under the Constitution to abolish slavery in the District of Columbia; but that that power ought not to be exercised unless at the request of the people of said District. “The protest is mild enough,” noted historian Harry V. Jaffa. “The crucial difference without question, was the insistence that slavery itself was unjust. Even here there is more of a shift of emphasis than a break with the majority. For the joint select committee which had reported the resolutions, even while denouncing abolitionism in unmeasured terms, had deeply deplored ‘the unfortunate condition of our fellow-men, whose lots are cast in thraldom in a land of liberty and peace.”9 . 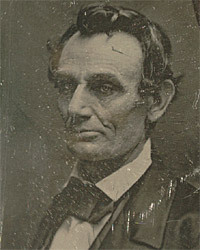 Contemporary biographer William H. Herndon wrote that although Mr. Lincoln apparently sought other supporters, only Dan Stone was willing to join with Mr. Lincoln in the protest. Stone was a fellow Whig attorney from Springfield who went on to become a judge in northern Illinois and Ohio. The two Sangamon County representatives apparently waited until after the Legislature decided on critical legislation to move the state capital from Vandalia to their home town of Springfield before introducing their controversial paper. Josiah G. Holland, Holland’s Life of Abraham Lincoln, p. 70. Herbert Mitgang, The Fiery Trial: A Life of Abraham Lincoln, p. 78. John G. Nicolay and John Hay, Abraham Lincoln: A History, p. 149-150. Roy P. Basler, editor, The Collected Works of Abraham Lincoln, Volume I, p. 75. Paul Simon, Lincoln’s Preparation for Greatness: The Illinois Legislative Years, p. 131-132. William H. Herndon and Jesse W. Weik, Herndon’s Life of Abraham Lincoln, p. 143. Roy P. Basler, editor, The Collected Works of Abraham Lincoln, Volume I, p. 74-75 (March 3, 1837). William H. Herndon and Jesse W. Weik, Herndon’s Life of Abraham Lincoln, p. 145. Harry V. Jaffa, Crisis in the House Divided, p. 197-198. William H. Herndon and Jesse W. Weik, Herndon’s Life of Abraham Lincoln, p. 144. Paul Simon, Lincoln’s Preparation for Greatness: The Illinois Legislative Years, p. 133. Douglas L. Wilson, Honor’s Voice, p. 164-165. Douglas L. Wilson, Honor’s Voice, p. 165. Kenneth J. Winkle, The Young Eagle: The Rise of Abraham Lincoln, p. 253. Paul Simon, Lincoln’s Preparation for Greatness: The Illinois Legislative Years, p. 130. Paul Simon, Lincoln’s Preparation for Greatness: The Illinois Legislative Years, p. 134. Paul Simon, Lincoln’s Preparation for Greatness: The Illinois Legislative Years, p. 136.